This is situated 200 m from the agora. The facade contains a large amount of spolia or reused material. 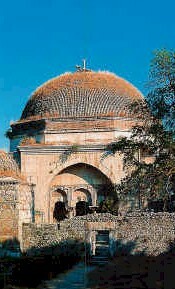 It was built by the Mentese Emir Ilyas Bey in 1404. The door stands at the end of a canopy supported by two pilasters. The prayer hall is roofed by a dome and there is a single, brick minaret. The minber and mihrab are both well worth seeing. The minber is decorated with arabesque motifs and the floor and walls are faced with marble. Although small, the building displays very fine artistic workmanship. The mosque once formed part of a complex comprising a medresseh and a caravanserai, but these no longer exist. The mosque is located at a distance of 1 km from the Sacred Gate. The mosque courtyard and the surrounding area is now covered by a cemetery.